a little and a lot: my new favorite thing! yup. it's my new favorite technology toy: google calendar. dude, google is taking over the world. and i'll let them. because they're awesome. i've been looking for a way to have a calendar that i didn't just have to keep at work or at home. (and without buying a kajillion dollor pda) here it is! 2. you have access to "public calendars." this can be two different types. 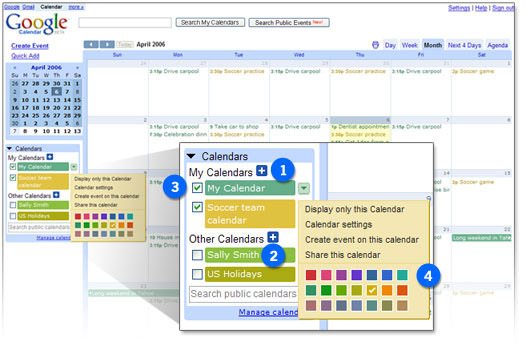 (1) your friends/family can share their calendars with you. for example, nick's calendar shows up in brown on my calendar. He also has access to edit anything on our youth ministry calendar, since he is in the office more than i am. (2) public calendars. this is how google works best. you type in something you'd like to have dates/times for, for example: "auburn football 2006." voila! google pulls up several different choices of people who have already entered the info, and you can just view it on your own calendar! my choices currently are: auburn tiger football, nba finals, red sox '06, and us holidays. nifty! 4. if you so choose, google will send you a daily agenda every morning at 5am to your gmail. whoa...watch out uber-organized people--here I come! okay, so maybe you're thinking that your life could not benefit from a tool like this. au contrair mon frere! (I probably butchered the spelling of that--sorry leslie.) what's the problem? you're not an office person or you don't have a lot of "appointments?" well what if you planned out your dinner schedule...you could add your kids' dr appointments or playdates...you can post your favorite tv show schedules or sports games. what if your book club had a public calendar and everyone could just add it to their own personal calendars? or soccer practice for your kids' team? wouldn't it be great to sit down every morning and have email remind you that little penelope has a doctor's appointment at 9am, after which you will drive jefferson to his tball practice, and oh--you're fixing lasagna tonight. i have big dreams for this new google addition! to learn more about it: click here. Jesse, wow this is pretty exciting. I think at this point I am intimidated. You have such high expectations for this thing and in return we all have high expectations for your attendance and timliness at ever activity entered. When is it going to say on your "out of town" calendar "To Little Rock to visit the Hovater's"? hey man. I have GOT To try this thing..being the super freak that I am. I am obsessed with calenders. Did you ever get that lil font prob. fixed?? yeah...we so need to talk sooon!!! love ya girl! Jesse, I love the google calendar. Immediately after I read your post, I went to Google and spent an hour getting it set up. I LOVE IT!! Thanks for sharing- you know I am one of those obsessed organization people. Hope you are doing well! Yes, Google Calendar rocks, doesn't it? My husband and I have been using it since April and we love it.